Under Ubuntu 9.10, wifi worked out of the box by enabling Broadcom STA wireless driver (System / Administration / Hardware Drivers / activating "Broadcom STA wireless driver"). Under Ubuntu 10.4, when I try to activate the driver, the following error occurs: "Sorry, installation of this driver failed. Please have a look at the log file for details: /var/log/jockey.log" => I no longer can use my wifi card (which worked great on ubuntu 9.10). same problem here. However the solution was to remove the bcmwl-kernel driver using Synaptic, then going back into Hardware drivers as suggested here: http://ubuntuforums.org/showpost.php?p=8628930&postcount=3. At this point, I was still unable to activate the Broadcom STA driver, but noticed a new option, the Broadcom B43 wireless driver. I activated it and the activation was successful. While I was in the Hardware Drivers dialog, I tried to activate the Nvidia Accelerated Graphics Driver and got Kernel Panic (caps-lock and scroll-lock lights blinking together, entire system unresponsive) so had to do a powercycle. I don't expect this was related to this bug, but thought I'd mention it. I'll open another bug for that if necessary. The above bug I filed was on 10.04. Turns out I had to go back to 9.04 due to another bug that was a show-stopper and I just had the same problem. Couldn't load either driver. Gave up quickly last night, but this morning I tried again and it succeeded. Could the previous failures have been related to the download site? goto's link also solved the problem for me. goto's link did not solve the problem for me. Installing linux-headers-generic does not provide the necessary linux/sched.h file needed to build the custom driver. thx goto, took me only 10 minutes to get wlan working again! Same problem on Ubuntu 11.04. From the desktop live CD running to try it out, the system recognizes that it needs the Broadcom STA driver and installs it from the CD, with no Ethernet connection plugged in. But after installing the OS onto the hard drive (with the Ethernet connection that it insisted upon before starting installation), the system gives the "blacklisted" error when it tries to install the wifi driver after reboot. I'm writing this bug report from that computer with the live CD running and the Broadcom proprietary driver installed, so the driver on the CD is definitely ok. The repository where the actual installed hard-drive system looks must have a bad version of the driver, perhaps a regression to a prior version by mistake. The computer is a Dell Inspiron 1764. I reinstalled 11.04 from the live DVD, without connecting to the Internet, thinking that the proprietary Broadcom STA driver would install from the DVD. But that didn't help. When I rebooted after installation, and tried to activate the proprietary driver, the driver installer said that the drivers were not installed and insisted that I connect to the Internet, and after I plugged in, it downloaded the driver profiles and found the Broadcom driver, but got the same error. If there's a way to install the driver that is on the CD and DVD, that would be a work-around until the driver repository is fixed. I don't know how to force that installation, however. I went to Synaptic from the System Settings dialog, searched for bcmwl. It found the kernel source for the Broadcom. Then I marked that source file for reinstallation, applied, and after it finished reinstalling, I rebooted. The driver now works. (I may have had to activate it first, don't remember, but if it isn't working, then install the driver either from system settings or by clicking on the icon when the top panel displays the restricted drivers icon.) I don't understand why re-installation of the source works from Synaptic, but the initial activation didn't work. It just does. Broadcom BCM4312, wifi does'nt work. I get the jockey error when I try to activate it from driver manager. The same problem on my Dell Inspiron 1545, which is running Broadcom Corporation BCM4312 802.11b/g LP-PHY (rev 01) according to lspci. I SOLVED this problem using the guide from Broadcom: http://www.broadcom.com/docs/linux_sta/README.txt (see at the bottom under "Ubuntu"). I think this is the same solution given by Stanley. The weirdest thing about this bug is that IT DID NOT HAPPEN WHEN I RAN THE LIVE CD. Probably means that Jockey needs to recompile the bcm kernel (which isn't really a problem when running from a thumb drive). SOLVED IT. Thanks all commenter above. 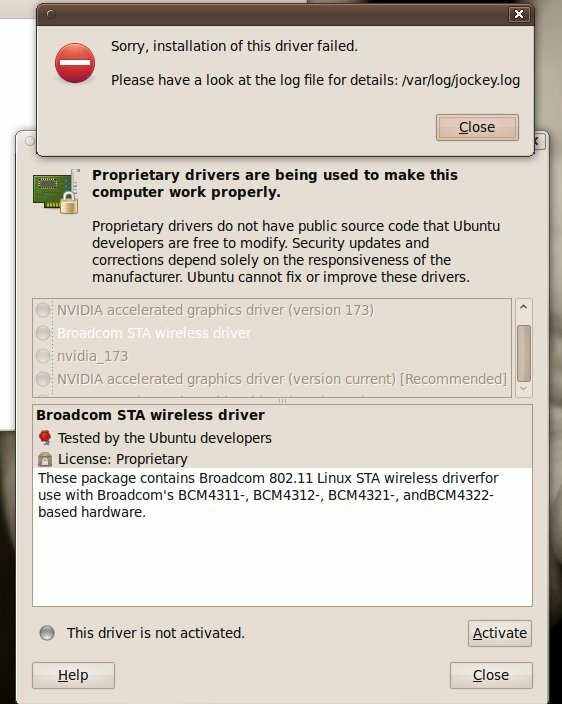 same problem: 11.04, jockey couldn't install the broadcom driver. I tried the goto solution, according to the link he posted, didn't work ( still don't know how to compile drivers). - went again to "hardware instalation" ( auf deutsch "treiber") and checked the broadcom to install. After restarting, the wlan was working as it should. ============ was working fine before, without this complication. ( I installed 11.04 in May, no upgrade ). This time, the problem happend. Blind shot for the problem: During the instalation I choosed to download important features during the installation. Otherwise, I don't remember doing anything different. After this "apt-get install --reinstall bcmwl-kernel-source" proprietary driver SEEMS to work but it doesn't. On the network manager I can see "Driver: brcmsmac" which is probably open source driver. Just got this on a Dell Latitude E5420. Uninstalling bcmwl-kernel-source and running jockey to activate the driver resolved the problem. I just ran into this with Precise, the first update after a fresh install. I solved it removing bcmwl-kernel-source package and letting jockey to install it again. Just upgraded from 11.10 to 12.04 on a 2 month old dell vostro 1540, and ran into this issue. from console, and it worked. Even the LED indicator is on. Load kubuntu-desktop in synaptic. USE PATCH CABLE NETWORK 500 MEGS of files. You can now use additional drivers in a graphical environment. Attempt to install your wifi driver. If it install your done. If it say's BLACKLISTED or check log file /var/log/jockey.log OPEN A TERMINAL and run "sudo gedit /var/log/jockey.log" if it has a series of errors scroll to bottom and see if it lists drivers as BLACKLIST. using the command "sudo gedit /etc/modprobe.d/blacklist-bcm43.conf" unblacklist the driver using (# driver ). The comments at the top of the file is guide for commenting. Do this for each PERTINENT file. Reboot. YOU THINK IT WOULD HAVE WORKED BUT NOOOOO! using the command "sudo gedit /etc/modprobe.d/blacklist-bcm43.conf" FOR each PERTINENT file and comment out every blacklisted driver from your manufacturer. # Warning: This file is autogenerated by bcmwl. All changes to this file will be lost. I ran into this issue today on Ubuntu 12.04 (amd64). It was working fine on kernel 3.2.0-23, until I upgraded yesterday to 3.2.0-45. After which I get same error as above. My workaround is to boot back from kernel 3.2.0-23. This now seems to be a dupe of bug 1097519. Shame that this bug has been around for so many years, still affecting people.